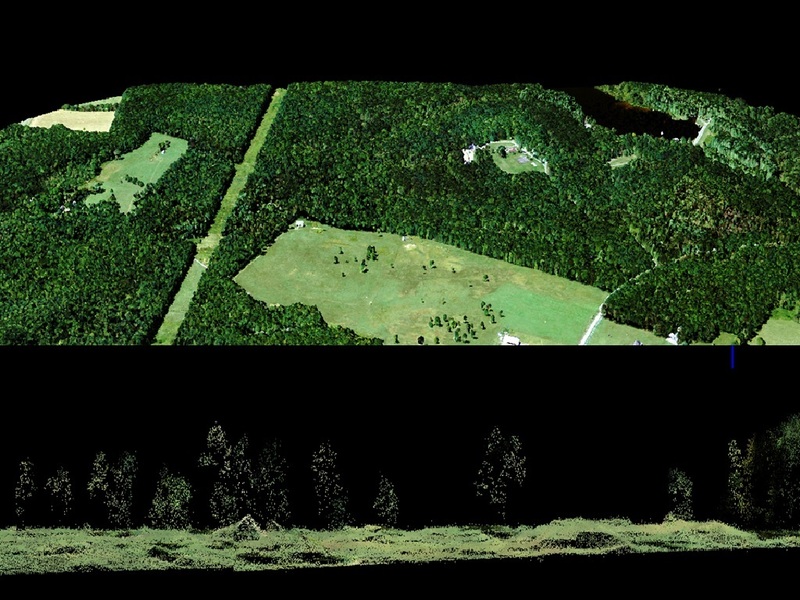 Single photon LiDAR (SPL) is a promising new technology for measuring terrain and vegetation characteristics over large spatial scales. SPL is different from conventional LiDAR instruments because it operates in the visible wavelength (532 nm) and requires only one detected photon per ranging measurement. This allows for rapid data collection over large areas with high point densities but also includes background solar noise within and above canopy. There is a lot of interest in using this technology for vegetation monitoring but its accuracies and overall potential remain largely unexplored. Noise-free SPL data draped with multispectral imagery (NAIP). The point cloud shows individual trees. The goal of this project is to evaluate an experimental SPL dataset for mapping canopy structure and terrain over an entire county of Maryland, USA. Attributes from SPL will be compared with discrete return LiDAR and other datasets to assess their accuracies. This study will improve our understanding of SPL and its capabilities for mapping forest structure and biomass over large areas. It will also inform future space borne missions [ICESAT-2] that are using this technology. + Single photon LiDAR was collected over Garrett County in Maryland using the moderate-altitude high-resolution quantum lidar system (HRQLS). + A total area of 1700 sq. km. was covered in 12 hours of flight time with 50% overlap between adjacent flight lines. + Point densities range from 8 – 13 /sq. m. and area higher in areas of overlap. 5) generate metrics at different resolutions from the normalized point cloud [lascanopy].